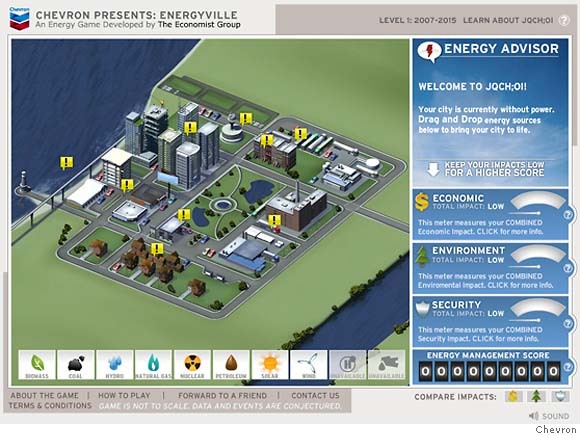 The Economist Group and Chevron Corporation launched earlier this month Energyville, an interactive online game that challenges players to meet the growing energy needs of their own city. Energyville, developed using data and content provided by the Economist Intelligence Unit, examines the economic, environmental and security opportunities and trade-offs associated with different energy sources. In order to provide fuel and power to their city’s homes, offices, factories and vehicles, Energyville players must balance the same competing demands faced by policymakers, businesses and consumers every day. Players decide how to supply a cartoon city with enough power for its 3.9 million people. You can choose from sources as eco-friendly as wind or as dirty as coal. Each choice has an economic and environmental cost. The better you balance those costs, the higher your score. Try using nothing but renewable energy, and an alert in stern capital letters will warn you that your city "needs petroleum." Paul Rossi, North American publisher for the Economist, said there are good reasons you get that message. Energyville starts in the present day, then moves into the future, when more alternative forms of energy become available. Right now, the game's speculative city still needs petroleum for cars and airplanes, Rossi said. The warning isn't an attempt to drum up business for Chevron, he said. Energyville is part of Chevron's "Will you join us?" 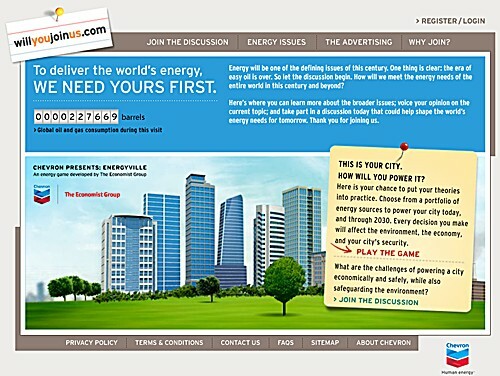 campaign, an effort to provoke and shape public discussion on energy supply issues. Many alternative energy advocates have viewed "Will you join us?" with suspicion, seeing it as a sophisticated form of greenwashing, or disguising environmentally unfriendly practices with eco-friendly actions. They may have the same reaction to Energyville. But Rossi said the game has been built with real data on the prices, availability and potential of different forms of energy. Energyville represents an average industrialized global city, with population and energy demands, uses and costs, based on projected patterns using data from the Economist Intelligence Unit and organisations such as the OECD and the Energy Information Administration. During the game, players must choose between eight prevalent energy sources to power their city up until 2015 and 10 different sources up until 2030. 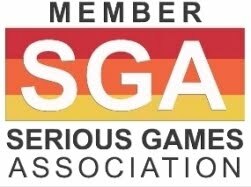 As players move through the game’s phases they learn about the characteristics of the energy sources and negotiate real life scenarios that can affect their energy choices. The economical, environmental and security implications of their chosen energy portfolio are calculated using an energy management points system. 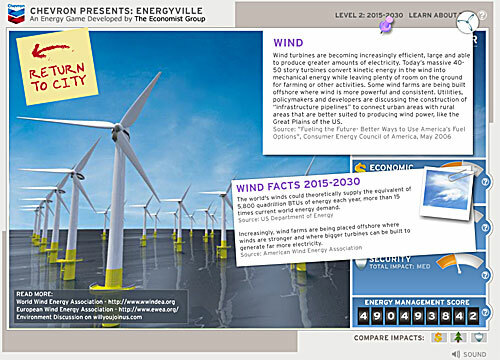 The flash-based software for Energyville was created for The Economist Group by Picture This Communications, a provider of interactive web-based services. 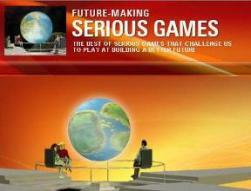 The idea for the game and most of the work behind it came from the Economist Intelligence Unit. Although part of the same company that produces the Economist magazine, it is a different division, specializing in supplying economic analysis to paying clients. The unit's analysis shaped the assumptions on which the game is based. For example oil shale - hydrocarbons trapped inside layers of rock - becomes a potential energy source in future years, but not in the present day. Adding more wind power will cost more than adding more nuclear energy. Those assumptions, however, aren't universal. Energy experts often disagree on the relative prices of different power sources, or whether sources like oil shale will ever pan out. Alan Nogee, director of the clean energy program at the Union of Concerned Scientists, took exception to the game's notion that nuclear power would cost less than wind. "That's highly questionable, especially when you're looking at the cost of new nuclear plants," he said. Still, after a quick glance at Energyville, Nogee found the game intriguing. "It's a very interesting idea," he said. "There are some interesting and potentially educational stats on current energy use."